Just Finished 1 & 2 Corinthians – 275 pages! After months of work I have just finished my commentary on 1 & 2 Corinthians for CatholicScriptureStudy.com. I am ecstatic! I enjoyed it thoroughly and learned a lot. I am glad it is done now since I leave for Israel on Saturday and can go without pressure. The night Jesus was put in prison over Holy Thursday — I am released! It is appropriate that Paul ends this emotional epistle with the invocation of the Divine Trinity. Each member of the Trinity lives at peace with the other in unity, love and joy. We as believers are to reflect these very qualities individually and corporately as the Body of Christ. 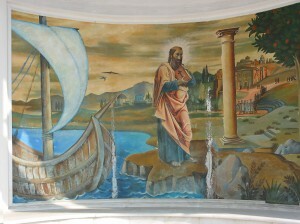 Paul prays to the Blessed Trinity to help the Corinthians. 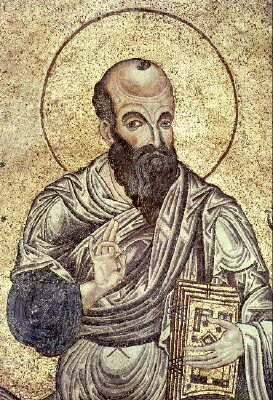 Paul holds ups the godhead as the supreme example of everything that he wishes for the Corinthians. The roosters crowed early the next morning. It was spring of AD 56. There was a cold nip in the air and it was still dark. A long journey lay ahead so they rolled out from under the blankets, got up off the mats on the floor and stretched. Pulling on their robes they slipped their feet into their well-worn sandals and grabbed some bread and fish from the night before. The canonical letter of Second Corinthians was finally completed. Paul rolled up the letter and sealed it. He handed the scroll to Titus who carefully tucked it in his rustic pack which he threw over his shoulder. The treasure was on its way to Corinth. Titus and his two companions (2 Cor 8:16-24) would go ahead of Paul to pave the way. It was far better that they arrive with this powerful letter in advance of Paul so the Corinthian church would have time to react and to get their house in order. They would either obey or be subject to Paul’s judgment when he arrives later. It was an act of mercy that Paul sent the letter ahead. And Titus was certainly the right man to deliver it. Being strong of character, diplomatic in style, dignified in conduct and orthodox and holy in teaching, Titus will help implement the corrections and grease the skids for Paul’s arrival. Paul’s mind shifts to other matters. He is now preparing for his long trip to Corinth after which he will sail to distant Jerusalem to deliver the finances collected from Macedonia and Greece for the impoverished Christians in Judea. He is also formulating another profound letter in his mind which he will write from Corinth. One of the problems in Corinth is the issues of circumcision verses uncircumcision and the salvation of gentiles. This needed clarifying for the church in Rome as well, along with the understanding of God’s covenant with Israel — and so much more. It is a good feeling to have the letter to Corinth finished. Now he can move on to other things. His mind is flooded with new issues, problems and letters he should write. When he arrives in Corinth he will call the amanuensis. Like other scribes before him, Tertius will settle down with parchment and quill and begin the frantic attempt to keep his quill racing at a pace that matches the rush of words flowing from the mouth of St. Paul (Rom 16:22). 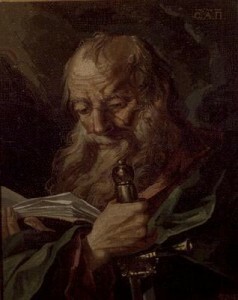 His composition will end up being the Epistle of St. Paul to the Romans. But for now Paul will break bread with the Macedonians in the morning, then pray and study Scripture before lunch. All day long he will be constant in prayer making special mention of the scroll making its way south, for his beloved Corinthians and for all the other churches struggling to live the gospel in a pagan world. If you don’t use Catholic Scripture Study International (40,000 members) you should check it out. Join a group near you or start your own. 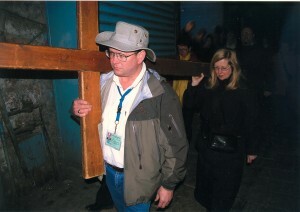 THURSDAY: I will join Steve Wood of Faith and Family and www.Dads.org on EWTN Radio to discuss Passion Week. The show will air at 2 PM Eastern time. You can listen at http://www.ewtn.com and go to RADIO or at www.avemariaradio.net. FRIDAY: I will be on Al Kresta Live on EWTN and Ave Maria Radio from 4-6 PM as I joined him on a pre-recorded show to discuss the details and pain of the crucifixion. You can listen at http://www.ewtn.com and go to RADIO or at www.avemariaradio.net. FRIDAY: I have just been invited by Drew Mariani to join him on Good Friday at 3:30 PM to discuss the crucifixion: its history, its implementation, its suffering and all about Jesus and his Cross. You can listen on-line at www.RelevantRadio.com. SATURDAY: Janet and I leave for Jerusalem! Stay tuned since I will be uploading pictures, video, stories and more to keep you updated and to take you virtually to the Holy Land. Big Poster! Big Priest! Good Friend! Two weeks ago Fr. Geoff Horton was the 2 millionth poster on my Defenders of the Catholic Faith Message Board! (Join for incredible discussion, answers, and fellowship! – click here. Of all the people who have posted he has the third largest number of messages. He is a wonderful addition to the board and answers so many questions and helps keep the board on target. For his post he won a full set of my 7 Footprints of God DVDs — the ones we’ve finished so far. 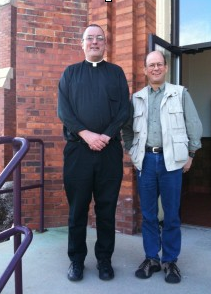 I was speaking at St. Mary’s in Utica Illinois and guess who showed up? Ah, you had too much of a hint. Yup, it was Fr. Geoff. It was great to meet him and personally give him the DVDs. Fr. Geoff, thanks for being a priest, thanks for serving Our Lord, thanks for being a pillar at the Message Board and thanks for driving 1. 5 hours so we could meet.